James Lecesne in THE ABSOLUTE BRIGHTNESS OF LEONARD PELKEY. James Lecesne is a highly accomplished and versatile writer and actor – and, even more importantly, a truly compassionate and admirable individual. He has written three novels for young adults, including Absolute Brightness, from which he has adapted his play, The Absolute Brightness of Leonard Pelkey. His acting credits include stints on Broadway, off Broadway, and in television. He was executive producer of the documentary film After the Storm, which followed the lives of twelve young people in post-Katrina New Orleans. And he wrote the screenplay for the Academy Award-winning short film Trevor, which inspired his co-founding of The Trevor Project, a nationwide suicide prevention and crisis intervention lifeline for LGBTQ youth. Quite a resume. The Absolute Brightness of Leonard Pelkey, currently being staged at the Westside Theatre on West 43rd Street in midtown Manhattan, revolves around the disappearance and murder of Leonard Pelkey, a flamboyantly gay 14-year-old, whose larger than life persona and absolute refusal to be anything other than what he was affected all around him. In the course of the play, we never do meet Leonard but we come to know him nonetheless through the words of all of those whose lives he touched. First among them is Chuck DeSantis, the hard-boiled detective in a small town on the New Jersey shore who investigates the Leonard Pelkey case. 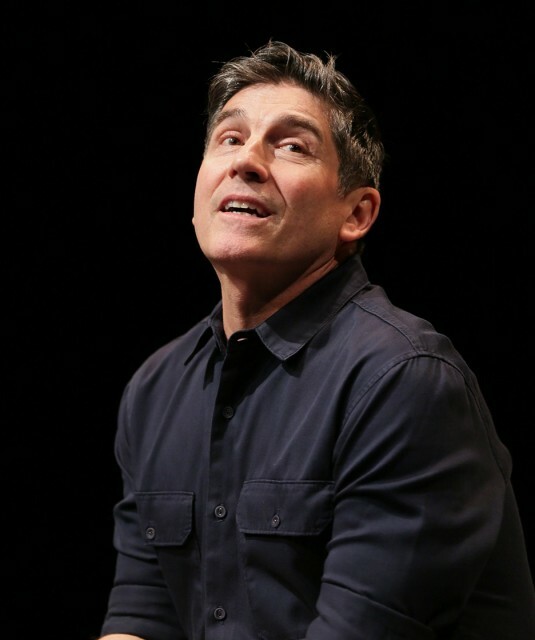 DeSantis is played brilliantly by James Lecesne – who plays every other role in this extraordinary solo tour de force as well – and that includes Leonard’s “aunt” Ellen Hertle, the shrill proprietor of the local beauty parlor who first reports Leonard missing; Phoebe, Ellen’s 16-year-old daughter who finds herself called upon to act as Leonard’s schoolyard protector; Gloria Salzano, the widow of a mob boss who discovers one of the shoes Leonard was wearing at the time of his disappearance floating on the lake near her home; Marion, one of Ellen’s clients, who attempted unsuccessfully to convince Leonard to “tone it down”; the Germanic proprietor of a watches and clocks repair shop who related to Leonard as a result of his own nostalgic recollections of his own lost son; the pretentious proprietor of the theatre and dance studio where Leonard had been studying, who is a bit fearful that he might be accused of pederasty (whether pronounced in the British or American fashion) for merely offering car rides to some of the older boys at his studio; and one of Leonard’s bullying schoolmates, hung up on video games. Lecesne plays them all with insightful precision, seamlessly switching from one character to another It is a truly virtuoso performance. The Absolute Brightness of Leonard Pelkey is, of course, a tragedy, as is any death, but most especially the unnecessary death of a child whose entire life still lay before him. And it is, of course, a mystery: who killed Leonard Pelkey? But it is much more than that, much more than a tragedy or a mystery: it is at one and the same time a revelation of the interconnectedness of all of us (underscored by Lescesne’s playing every role) and a celebration of our differences. As Marion related it, Leonard once told her that “if he stopped being himself, the terrorists would win.” And it is that sentiment which pervades this production and which results in the play being such an uplifting one, despite the tragedy of the unusual 14-year-old boy’s untimely death.